I used to listen to Art coming home from work late at night. I'd stay up until 5 AM till his show was over. I have signed copies of his books The Art of Talk and The Quickening. I remember the time he came back from a news break and could barely talk. He said he was trying to repair a tape deck shelf during the break and super glued his lips together accidentally. Man what a riot! I remember the time he was talking about life in the hereafter and said well........we're all going there. He made it. I would listen to hi while working the long cold nights doing security. [Long cold boring nights] he and George kept me awake Thanks Art and RIP. I also have his book he co wrote with Whitley Strieber Coming Global Superstorm. George was on a local station in St. Louis for years before he did C2C. I listened to him late at night while I was at work and called into his show a few times. I always thought he was better on the local station than C2C. 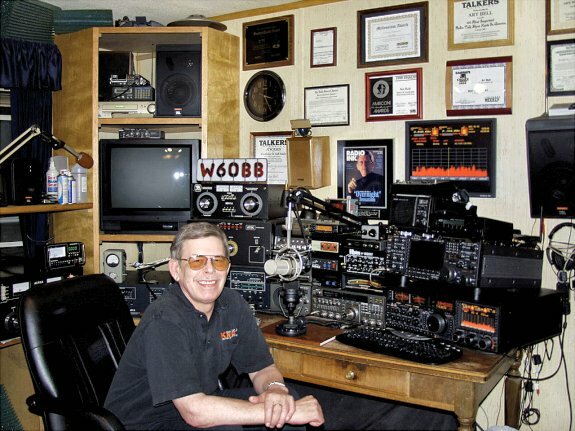 Nobody could replace Art Bell. Listening to a special tribute to Art Bell C2C Show ! So who else stayed up late to catch the special Art Bell memorial tribute C2C show 4-19 ~ 4-20 ? he said an F-16 Intercepted him and click that was it. He said he was trailing a 30ft cellular antenna wire. I could not hear any engine noise coming from the rear mounted upgraded 145HP engine, just cell chops. In the final hour they replayed the famous 1997 urban legend show "Mel's Hole" from caller Mel Water's. Many special guests, archived show clips and the final song "Midnight in the Desert" from Crystal Gayle. Midnight In The Desert which she wrote for Art's new radio program. Unfortunately I have to get up very early for my present job so no late nights for me. I do wish they would bring Pop Comm back though. I still listen to C2C most nights on WOAI all the way over here in Alabama, first started listening to Art Bell when I worked on the road late nights. I could usually find him anywhere in the country and always enjoyed it. I heard that recent replay of the guy in the Long EZ and also heard George give the news of Art's passing. We've lost quite a few this year. It was always interesting. Q: Rick H, do you RX 740 AM KTRH over in Alabama ? Wow, WOAI is a 50KW FCC designated "Clear Channel" and they claim it can reach up to 33 states. directional antenna to protect CFZM Toronto, a Class A station on 740 AM. Does KTRH reach Alabama? Without their directional antenna, KTRH could only have been licensed with 10 kW day and 1 kW night. The AM band is allocated into three categories: local, regional, and clear channel (or Class A station). and directional antennas for varied day and night operation; since AM band signals travel further at night. Q: Anybody else question that caller claim of flying his Long EZ plane but having no audible engine noise? I don't know if I can get KTRH but will check tonight and post here tomorrow. No audible engine noise is not uncommon I've found on aircraft communications. I've spent enough time piloting light singles and am surprised at how good the sound quality usually is and have all the nearby Unicom and ATC frequencies on a scanner. If I didn't recognize the vocabulary I would not know it was aviation, it is that clear. That guy supposedly heading toward area 51 didn't sound real to me, that could easily have been a fake even if Art Bell didn't know it. Funny how it suddenly ended. Rick forget aircraft communications and noise canceling microphones for this particular callers case. He said he was calling on a "cell phone" and that his cell phone was using a 30ft trailing wire antenna. The FCC allocated frequencies for AMPS was 824-849 MHz for downlink and 869-894 MHz for uplink. Consider the call time and distance he said he traveled plus consider many cell tower hard handoffs ! using a reported seatback GTE Airphone (Verizon) which FBI reports lasted 65 minutes @ 500 MPH ! Used to listen to him on coast to coast radio and to my surprise even caught him on the 40 meter ham band one time. I was stoked! Rest in peace sir. You will be missed. I'm certainly going to miss Art!! Has anyone noticed on the Midnight In the Desert website, Midnight in the Desert - Live Late Night Talk Radio, that Heather Wade is no longer host? Wonder what happened there?? I found Art Bell on WKBN (570) out of Youngstown (alternately, 1170 out of Wheeling) (I lived in the Pittsburgh area) in early 1995 after I could not sleep well because of pain from a car accident. I liked how he would have a guest on and if he felt the guest was really full of B.S., he'd give them enough rope to hang themselves but I also like his open mind, he had a good balance on that. I also liked the early callers then like Charlie Liberal and Dr. Democrat, they were a howl to listen to as well as the ever popular J.C. who always said Art Bell was "going to Hell." The way Bell handled J.C. was hilarious I also liked all the topics he had from politics to the paranormal that later became more of the norm. I'm bummed he is gone now. George Noory does a great job, I cannot talk smack on him we are all individuals. I do miss Art though. 1170, WWVA is my main Coast to Coast AM station since I moved to just north of Wheeling. He's what made Talk Radio interesting enuff for more people to tune in. He was a one of a kind and a groundbreaker in the business, he will truly be missed. Bell died from an intoxication of multiple drugs including oxycodone, hydrocodone, diazepam, and carisoprodol, according to the coroner's office. His death was deemed "an accident," the coroner said. Sad really. I know he used to talk about his painful bad back. I suspect those drugs were for some of that. He said he used to work for a telecom co. in his early years and was climbing a pole and cut out and pushed off instead of burning it down and suffered back injuries that always plagued him.